With this strategic partnership, Al Saeedi becomes the exclusive distributor in the UAE for NEXEN TIRES, the South Korean tyre major. 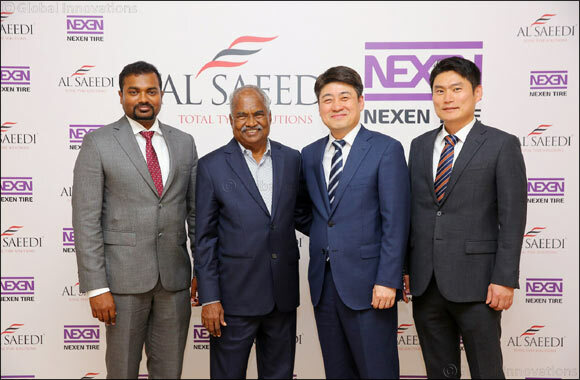 DUBAI – May 3, 2018: South Korea’s NEXEN TIRE Corporation, one of the fastest growing tyre manufacturers in the world, has announced an exclusive partnership in the UAE with Al Saeedi Group, the Dubai-headquartered specialists in tyre distribution and Tyre service solutions. NEXEN TIRE manufacturers superior quality tyres that comply with international quality standards. NEXEN TIRE sells 40 million tires to more than 140 countries annually, with more than four million tires sold throughout the Middle East. NEXEN TIRE is a longtime partner of Manchester City Football Club, the newly crowned English Premier League Champions. Al Saeedi Group is at the forefront of bringing the best products and solutions in the UAE’s tyre industry. The Group operates nine Saeedi Pro service centres across the UAE, in addition to seven unique mobile service units that cater to customer needs round the clock. “As a global tyre manufacturer, we needed a distributor with a strong presence in the UAE market and Al Saeedi provides us that platform. NEXEN uses the latest technologies to manufacturer defect-free and high-quality tyres that meet the needs of customers across different segments,” he added. “This exclusive agreement will give us an edge to further capture the domestic market. We have great customer loyalty across the UAE. Al Saeedi brings the highest quality of products and services to the UAE market. We have always been on the lookout for reliable and strong manufacturers that complement our vision and approach,” he added. “In the UAE, Al Saeedi Group through its multiple sales and marketing channels has popularised NEXEN in the dealer, fleet, and rent a car segments; as well as government and semi-government sectors and also through their nine retail outlets,” Mr Lee further said. “We guide our customers in their purchase decisions and select what is best for their vehicles from our a wide array of products. The growing demand from our loyal customers has led to further expansion plans. We will continue to look for new ways to enhance our products and services and ensure optimum customer satisfaction,” Mr. Malattiri concluded.